There are many books on the topic ' the definition of India.' Many of them presenting their own theories, some of them meticulously researched and some of them written with an aim to propagate a particular ideology. 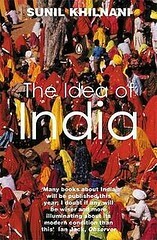 The Idea of India is one such book which defines "Indian-ness" from the viewpoint of Sunil Khilnani, a Professor of Politics, and Director of the King's College London India Institute. The author describes the events of past hundred years to tell us what is the unifying us as Indians. Or is there any unifying thing at all? Or is the respect of diversity is unifying India? When the Indian Union was formed in 1947 many in West prophesied that India won't survive owing to its own differences. The Western Idea of nationalism meant that India is a continent with different cultures like Europe is. But India stands today united and stronger than earlier. The author tries to find the reasons behind this. In the first section named 'democracy', Khilnani talks about how India transformed into a democracy and he presents a timeline which starts from British Raj. The aim of the British Raj was to sustain their rule in India and in the process they introduced few steps to improve the social living of India or they presented these steps like that. Although congress was established in 1885, it did not demand independence till a decade or two after its inception. It was used a platform for debate, but as the representation of different sections of society increased in Congress, it considered itself true representative of India masses and rightful inheritor of Raj. Gandhiji dominated the Congress from the 1920s till his death and he had his way as in the case when Subhash Chandra Bose had to step down as Congress president. With the demise of Gandhiji, the idea of village self-rule was dropped and India adopted a democracy then popular in the west. Khilnani also shows the contrast between Nehru and Indira. He also considers the 1962 war with China as his greatest failure as does Ramachandra Guha in India after Gandhi. Khilanani says that while Nehru was inclusive and tolerated dissidence to a level, Indira Gandhi was more authoritarian and she established a direct contact with masses giving them hopes. She portrayed constitution and other authorities as hurdles coming in her way while she was working for the masses. During Indira's days, the party became merely an instrument to bring votes and young people in youth congress saw politics as a shortcut to reach the top. Among many of the deformations that entered the democratic system, there was one positive point too. Public's faith in the voting system increased more and more, and it became a norm for voices standing for suppressed people to enter the election system. In the second section titled "temples of the future", the discussion is on the economic policies and their achievements since independence till 1997. The author starts with describing socialist democratic policies of Nehru in early 1950s and ends the section with an account of India's situation post-Liberalization drive of 1991. Nehru gave priority to heavy industries and along with Planning Commission, a body formed to give economic policy directions, India wanted to achieve economic growth and security through these heavy Industries. It is a different story that we did not succeed too much in that initiative and most of the state-owned enterprises started incurring heavy losses. Planning Commission itself lost its authority that it had in Nehru's period and economic policies were being decided by Finance Ministry after Indira Gandhi's rule. The author discussed in detail the role of P. C. Mahalanobis in giving scientific direction to India's economic policy formulation. During Indira Gandhi's rule, actions like the abolition of Privy Purses, nationalization of banks and expansion of state-owned enterprises, aimed more towards getting political mileage than being guided by economic thoughts. State-owned enterprises became a symbol of patronizing and they failed to create any wealth for the state. Although the rate of inflation was in control for most of the period since independence till the late 1980s, things started deteriorating so much so that in 1991 we had foreign reserves enough for only two weeks of imports. India was on the edge of a serious fiscal crisis and faced the possibility of defaulting on its own borrowings. IMF gave loans to India on one condition that a range of comprehensive structural reforms will be carried out. At that time, a new government was formed and liberalization of economic regime started. The third section is devoted to the development of Indian cities, the seats of colonial power. The author describes the tendency among early nationalists of Congress to unseat the British from these cities and occupy the high chair while everything else remained unchanged. That tendency changed only after the advent of Gandhi in the political landscape in India when the focus shifted to villages, although Gandhi himself had started off his political career in a city and was successful because of his ability to mobilize people in cities, but he refused to follow the British model of power blindly. Big port cities of Bombay, Madras, Calcutta were huge commercial and economic centers but British Raj needed something more magnificent, something which does not mix with the past and can be shown as an example of modernity to the Indians. And thus was born the city of New Delhi. The author agrees that the British control of India existed because the cities existed. What Raj tried to do with New Delhi, Nehru did same with Chandigarh, a city built as an example of modernity. In near future, India can become the country with the highest population in cities because of increasing pace of urbanization. In the fourth section, the author tries to find the answer to "Who is an Indian." Then he travels through history to say that there was no geopolitical entity called India and it was British Raj which created India by amalgamating different princely states and declining Mughal Empire. Even after fifty years of independence it is asked that what is the definition that defines an Indian? While searching answer of this question, the author describes various nationalist movements which happened in India during last two hundred years. He also describes the version of Gandhi, that of a village rule with daily tolerance among all communities and the version of Nehru, that was based on his version of, sometimes imaginative, history where "India appeared as a space of ceaseless cultural mixing, its history a celebration of the soiling effects of cultural miscegenation and accretion." The author also contests against the Idea of Hindu Nationalism and described them as something inspired by Western nationalism movements but which was unlikely to work in India because here we do not have a common language, religion or ethnicity, but a mixture of these. The political developments of the late 1980s and early 1990s also cemented the identity of different regions and communities. In words of the author one who honors all these diversities is a true Indian. While describing these things the author could have been more neutral instead of sticking with a particular ideology. The author heaped lavish praise on Jawaharlal Nehru for his thoughts, comfortably ignoring his few deeds such as the Sino-Indian war in 1962. In fact, author rues the war because it led increased military expenditure and military officers ending up having more say in strategic matters. What author fails to emphasize that the Idea of India can flourish only if its borders are safe. Also, the author criticized home-grown nationalist movements more than he did British Raj for colonialism. Overall this book is an interesting read especially first two chapters even if you do not agree with author's viewpoint, presented in nice story-telling style.